Styles: font, headline, padding & more! In WordFly's Modern Editor you have the ability to edit every part of the CSS that makes your design. We call these elements Styles. You have access to all levels of the CSS styles from fonts, line height, headings and everything else. Review how to update some of the basics and then how to go further with your styles. How do I retain my styles in future designs? Styles are the brand elements of your design. From paragraph (text size, font choice, line height) and headings, to background colors and margin or padding. Use styles across all parts of your design to set the brand consistency. All your Styles can be set easily under the STYLESHEET tab in Modern Editor. You'll see this tab on the edit content panel (left side) of Modern Editor. When you first open the STYLESHEET you will see 4 areas you can open: ESSENTIALS, SINGLE BLOCKS, STRUCTURAL BLOCKS, and GROUPED BLOCKS. The section titled ESSENTIALS will be opened initially. Next we'll review our recommendations for what parts to pay attention to updating in the STYLESHEET and also how to update styles in individual blocks rather than globally throughout the design. We recommend setting up ESSENTIAL Styles before adding any text or image content to your design. Under the ESSENTIALS section you can set styles for background colors, typography, buttons and even some padding and margin in the design. Minor variations in the ESSENTIAL styles can be achieved on a macro level within individual text areas of the design. 1. 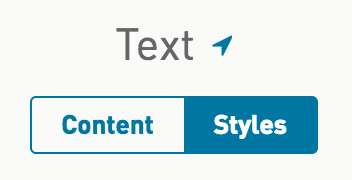 In your Modern Editor design, click the Stylesheet tab. Styles set up here will cascade down to single blocks. Let's review each section in more detail. Under ESSENTIALS, click Background. Here you can access the styles for your design Body and Email Container. Select Body, and update the background color of your design. Select Email Container, and update the margin and padding and set a max-width for your design's container. Enter your color codes for background color or font color. Or, use the color picker to select the correct color. Any of these Background styles can be overridden in individual blocks by editing the block's container. Under ESSENTIALS, click General Styles. We call this section General Styles because style updates here will be used across all individual blocks like text blocks, button blocks, heading bar blocks and image blocks. Under General Styles you can globally set styles for paragraph, fine print, caption, links, headings, as well as bold (strong) and italics (emphasis). Watch your styles update on the preview panel (right side). Set image styles. Click IMAGE STYLES. Set padding and margin for image left and image right classes. These styles will be used in text blocks when you upload an image to a text block. Set button styles. Click BUTTONS. Set how you want your buttons aligned throughout the design (right, left or centered), set button background color, padding around your button text and your button font. Set your font styles. Click TYPOGRAPHY. You have full access to setting the styles for your paragraph (font family, color, line height), your links, your image captions, heading bars, bold, italics, and all your heading styles. What is 'Base' under General Styles? Under ESSENTIALS > General Styles you will see Base. This sub-section of General Styles is where you can set up your font style and have it apply to ALL other sections that use fonts. For example, when you set Base your paragraph, link, caption, fine print, and headings will all use the same font styles. Do you plan to copy+paste text content from a Word document? Then 'Base' will be a life-saver. Learn how to effectively do this and retain all your styles from Word when pasted into Modern Editor in this support article 'Best practices for copying from Word'. Enter your color codes for font color. Or, use the color picker to select the correct color. Type in the font you would like to use or click inside the Font Family field to select one of the available fonts. Learn more about fonts in this support post. Any of these global styles can be overridden in individual text blocks. 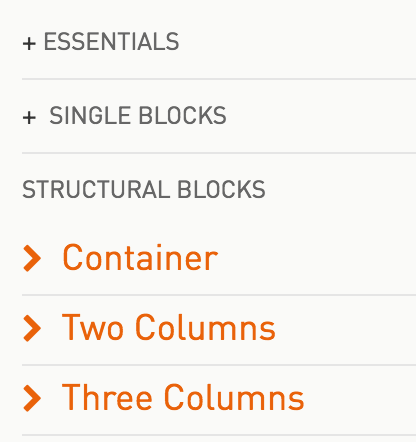 Once you finish setting up ESSENTIAL Styles you can move onto the styles for SINGLE BLOCKS. However, you only have to update additional sections if you really need to. Your ESSENTIALS > General Styles will carry through to all these other sections. We call this SINGLE BLOCKS because it refers to all the blocks in your template that you can pull over one by one into your preview panel. 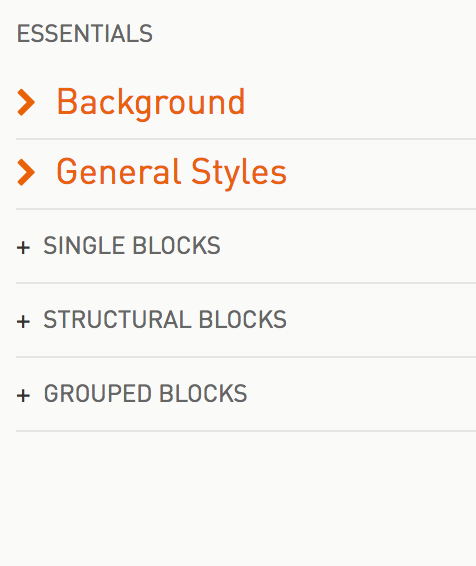 It may not be necessary to update all of these block styles since (1) you will set up ESSENTIALS > General Styles first and many updates will carry down to these blocks, and (2) your design may not have all of these blocks. We recommend updating the ESSENTIALS first and then update only the blocks you need to update. Watch your styles update on the preview panel. The primary updates made to SINGLE BLOCKS are to margin, padding, and background color since these details would not be updated through the General styles. Here's an example of opening the Text styles and adding 25px margin around the text block area. All text blocks will get this margin applied. Adjust a block's margin and padding under the 'container' for that block. Once you finish setting up ESSENTIAL Styles you can move onto the styles for STRUCTURAL BLOCKS. However, you only have to update additional sections if you really need to. Your ESSENTIALS > General Styles will carry through to all these other sections. The main updates made to STRUCTURAL BLOCKS are to margin, padding, and background color. Here's an example of opening the Two Column styles and adding a background color to the container. All two column blocks will get this background color applied. 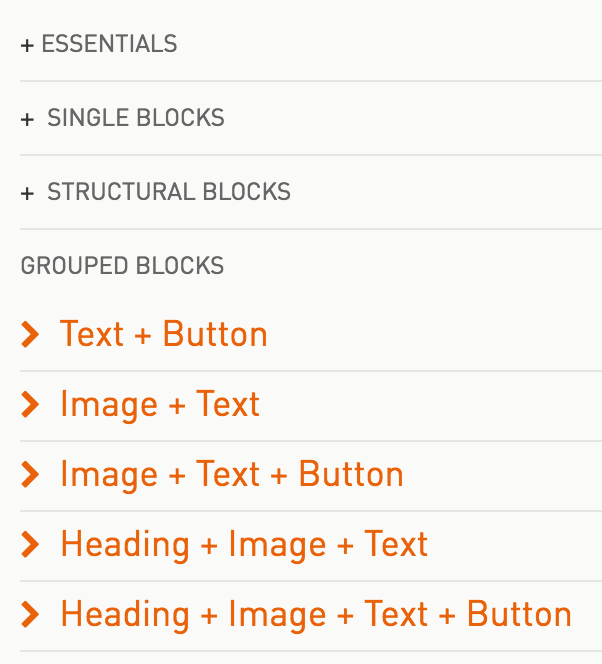 Once you finish setting up ESSENTIAL Styles you can move onto the styles for GROUPED BLOCKS. However, you only have to update additional sections if you really need to. Your ESSENTIALS > General Styles will carry through to all these other sections. We call these GROUPED BLOCKS because 2 or more single blocks are being grouped together. 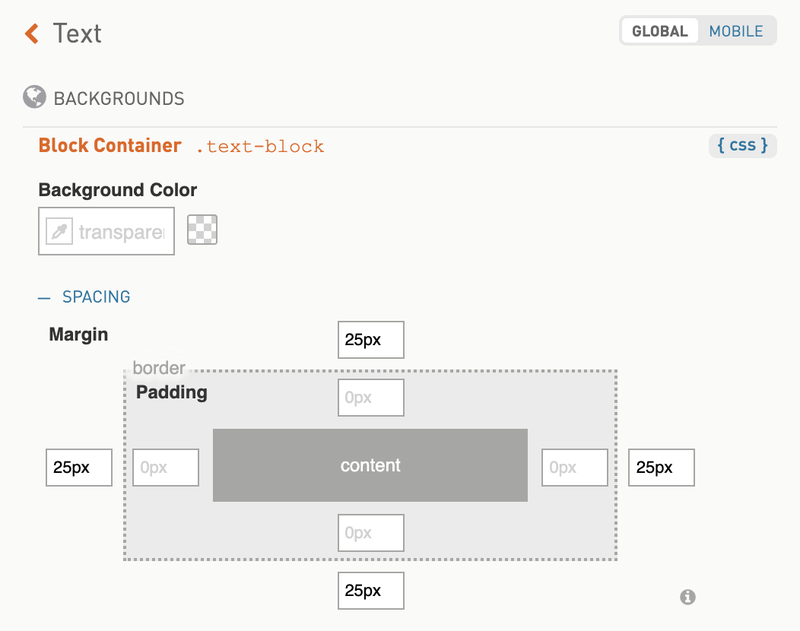 These are quick ways of adding more than 1 single block to your design with a single drag and drop. Set up your STYLESHEET Styles first but keep things flexible by overriding those styles on an as needed basis within individual blocks. 1. Click on a block from your preview panel. 2. Click on Styles from the edit content panel. 3. 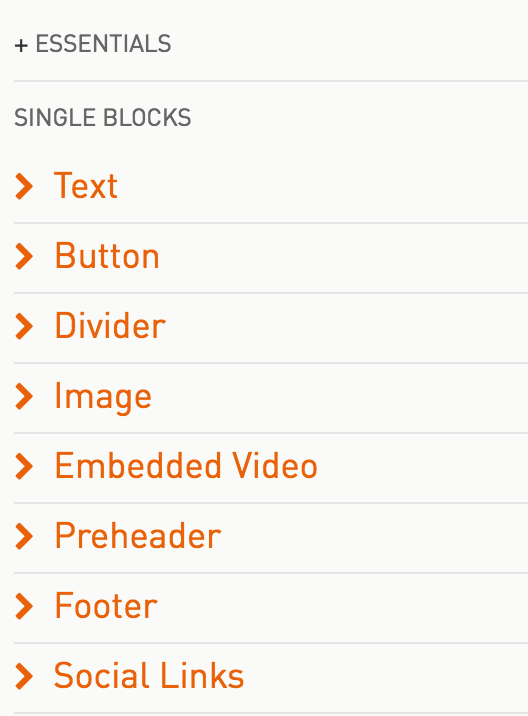 The default is to edit styles for 'This block'. 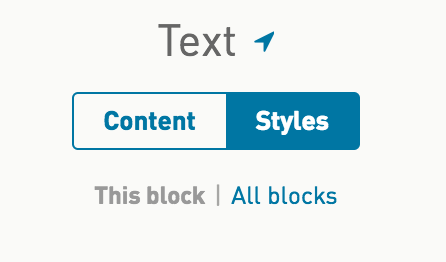 When you edit styles under 'This block' you are only modifying the styles for this block. You will not see these styles update across all blocks. This gives you the flexibility to deviate from the main STYLESHEET styles. *To edit styles globally, toggle over to 'All blocks' to edit the styles at STYLESHEET level.